Well after leaving it with her for 4 weeks I called this week for her feedback. ‘Have you tried it?’ I asked. ‘Well’ she said…’I use it every day, it’s BRILLIANT!’ She got really animated telling me how you can get loads in it, they don’t just have to be Avent bottles, how she ‘s taking it on holiday next week (just the smaller part) how it’s really fast and keeps everything sterilised for 24 hours. She was so animated, this is obvously a big hit,. She declared it her best steriliser yet and this is baby number 3! I think it is a very nice looking steriliser, more slimline than the big round ones and just so neat. Hayley liked that you didn’t have to do lots of fancy arranging of your bottles and dummies etc but you could just get everything in quick. Definately designed with mums in mind. 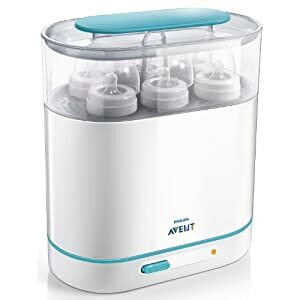 Philips AVENT 3-In-1 Steriliser costs £39.99 abvaible from Amazon and many other leading stores. Previous Post 999 for animals…………..